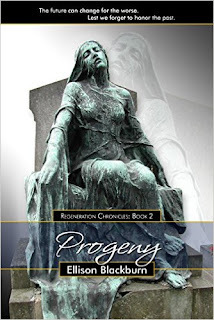 The Regeneration Chronicles continue with a story about a legacy bestowed, an inheritance claimed, and each individual’s responsibility to him or herself and mankind. The future can change for the worse, lest we forget to honor the past. Nineteen-year-old, Emery Kidd is one of two historians for her community. As a Chronicler, she is aware of the minute details of a society dramatically changed in the course of the two hundred years since cellular regression began. However, it is only now, after one of her lifetimes has passed, Emery discovers an important fact about her own heritage. She is the daughter of the most famous of regeneratives to have ever lived. Consequently, Emery is also quietly learning just what it means to be the daughter of a martyred woman. Undoubtedly, she bears a strong resemblance to her mother, but more than auburn hair and expressive facial features, Emery would like to believe she’s inherited the same strength of character as well. And yet, believing and knowing are entirely separate matters. Since everything changes with time—in varying degrees—and destiny often unfolds a plan unforeseen, Emery may just find the opportunity to test her belief. In fact, the entire human population will come face to face with their true inheritance. The question is how this legacy will be received. For the future is inevitable, this much is certain. Lest we forget, the mere passage of time does not come with it the entitlement to life. To live and prosper is a path that is earned, but mankind has seemingly forgotten this. Can Emery remind the world that survival requires conscious effort? Will Emery and her friends, Cassidy, a fellow chronicler, Liam, a brilliant engineer, and Aiden, a reserved mediator be enough to save the oblivious many? Ellison Blackburn has been a web designer/developer for over fifteen years. Next to writing fiction and poetry, her passions include painting and collecting vintage thingamabobs. 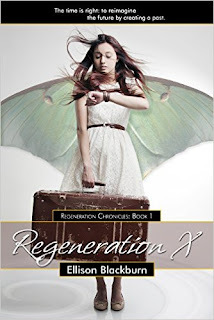 She is the author of Regeneration X and Progeny, books 1 and 2, respectively, of the Regeneration Chronicles. Raised in Chicago, Ellison relocated to the Pacific Northwest with her husband and their three beastly, furry children.